Trello is is a great choice if all you need is a basic Kanban board for tracking your project. It has unbeaten usability that feels intuitive even for the technically challenged. It just works. With a single board, you organise your cards into lists. That's straightforward. How to link together cards between different boards that are thematically related? How to see the progress of your work as your team completes tasks? How to plan your work and create roadmaps? How to create a record of the work you’ve completed so that you can easily refer back to it at a later stage? Epics Cards Power-Up is a free add-on for Trello that solves these problems by allowing to group cards into larger themes, also known as epics in agile vocabulary. However, you don’t need to follow any specific methodology in order to benefit from this add-on. It’s just a simple board utility that adds another layer of hierarchy to your Trello boards to help you to track work across multiple boards. Epics are just a way of grouping tasks into containers that can span multiple boards. Why do you need that? In our case, it is that we have our backlog scattered across bunch of boards: icebox, bugs, content creation etc. When we plan new features and releases, we want to be able to include cards form all of those boards without moving them away from the boards where they currently are. For example, you may have two teams working on two separate boards. With this add-on, you can select cards from both of those boards and group them together without moving them to yet another board. The list is split into two tabs, Open and Done. Tasks added to the epic goes under the Open tab. Once they are completed, they move to the Done tab. The progress bar above the list shows the current progress of the epic. Epics are transient, they have a beginning and an end. Once all tasks assigned to an epic are done, the epic is completed. After that, it functions as a record that you can refer back to at a later stage (e.g “what were the tasks we completed in the website restructuring last summer”). For each of your Trello board, you can select one or more lists that are containers for epics. Any card that is moved to such a list become an epic, and other cards can be assigned to them. In addition, you can select the list where cards are moved once they are done. As soon as you move a card into the done list, it will be shown as a done task in the epic card and the progress bar is updated accordingly. Here’s an example board containing three epic lists: Next epics, Epics in progress, and Epics done. That’s your product roadmap. The higher the card on the list, the higher the priority. At any given time, you have a full visibility on what bigger themes are currently in progress, and what their status is. Your future roadmap, represented by the Next epics list, is updated in real-time as cards are assigned to those epics. Re-prioritising your future roadmap is just a matter of reordering the cards on the list. Once an epic is complete, the card is moved to the Epics done list. That provides a record of all the work that has been completed in the past. You can click open any of the past epics and find the links to the cards that were assigned to those epics. You can still access them even if they are archived already. Once you’ve started working this way on your Trello boards, you start to wonder how you were ever able to work without having this kind of higher level view across your boards! But perhaps the most important aspect of the status badge is that it is linked to the associated epic. When you click the link, you will be redirected to the epic card, allowing easy moving between epics and individual tasks. You don’t need to have any specific structure in order to use the Epic Cards Power-Up, it can be used with any board setup. Choosing the right structure depends on a couple of factors. Do you have a single team or multiple teams? Are you working on one or multiple projects at once? Here are some sample setups for inspiration. And it’s all fine if it works for you. It’s not exactly the use case that this Power-Up was built for but if you find value in using epics within a single board setup, then go for it! if you are working on multiple projects at once, or have multiple teams working on multiple projects, then the single board setup is unlikely to work for you. Instead, your tasks are scattered across multiple boards. In this setup, you can have epic lists on multiple boards. You can choose how you want to share the epics between boards. In this example, boards that belong to the group A are sharing the epics so that any epic created within those boards are visible on other boards in that group. That means that you can assign cards to epics that are in another board. That makes sense if all those boards are somehow related (e.g. each board are used for tracking different aspect of the same product or project). You may also have boards (B and C) that have nothing to do with any other board. Maybe these boards are used for tracking some work that has nothing to do with the project associated with the group A. In that case you don’t want to share the epics created on those boards with boards in group A. As such, B and C would have their own set of epics that are visible to them only. The visibility of the epics is controlled by the “share epics with other boards” checkbox in the Power-Up settings. If you’re working on a big project that spans multiple boards, you may want to have a dedicated board for epics only. This provides you a single view across all of your boards. When arranging the epics this way, you don’t only see what work have you planned for the future, but also what have you done in the past and when was that work completed. This approach is described in more detail in this earlier blog post. That’s pretty cool, right? Having a tool like that makes you a real roadmapping guru 🧘and Trello the best roadmapping tool in the market hands down! 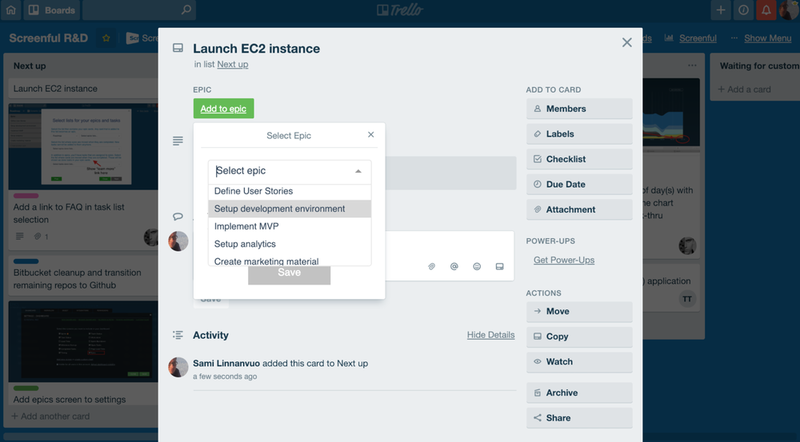 The Epic Cards Power-Up is a free add-on for Trello that gives you the power to manage and track work on a high level. It’s a stand-alone add-on that runs entirely on Trello’s infrastructure. Your data is not sent to a 3rd party server. We aim to keep it free for a foreseeable future (after all, it’s just a single feature). So go ahead and give it a try on your Trello board.